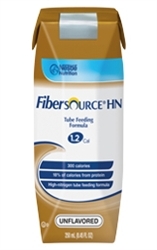 Fibersource® HN 1.2 Complete Tube Feeding Formula with Fiber provides higher protein and calories than standard feeding formulas. It provides 1.2 calories per mL and 53.6 grams of protein per liter. Fibersource HN has a fiber blend that helps support digestive health and normal bowel function. Fibersource® HN is unflavored and comes in 250 mL cartons (as shown in image) or ready to hang 1000 mL or 1500 mL bags for tube feeding. Appropriate for lactose intolerance*, gluten-free and kosher. Provides nutritional support for general malnutrition, elevated protein requirements, and bowel function. Water, Corn Syrup, Soy Protein Isolate, Canola Oil, Contains less than 1% of Soy Fiber (Insoluble Fiber), Medium Chain Triglycerides (from Coconut and/or Palm Kernel Oil), Potassium Citrate, Partially Hydrolyzed Guar Gum (Soluble Fiber), Calcium Phosphate, Magnesium Phosphate, Salt, Maltodextrin, Sodium Citrate, Sodium Ascorbate, Calcium Citrate, Choline Chloride, Polysorbate 80, Alpha-Tocopheryl Acetate, Zinc Sulfate, Ferrous Sulfate, Niacinamide, Vitamin A Palmitate, Calcium Pantothenate, Copper Gluconate, Magnesium Oxide, Vitamin D3, Citric Acid, Pyridoxine Hydrochloride, Manganese Sulfate, Thiamine Hydrochloride, Riboflavin, Folic Acid, Chromium Chloride, Biotin, Potassium Iodide, Sodium Selenate, Phytonadione, Sodium Molybdate, Vitamin B12. About to place another order! We received the items much quicker than expected. Excellent customer service. We will be ordering regularly.